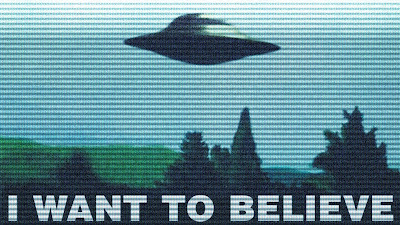 If one thing ruins this X-Files revival, it will be us. It won't be Chris Carter's zany and plodding scripts - you liked that twenty years ago. It's not the actors aging - Gillian Anderson has only gained more gravitas with time. No, we've changed. We've changed in a way that can screw this up for us. I had a great time watching the premiere last night. It captured the unabashed hokeyness of the original series, a willingness to believe things that no one in my social groups does. It is once again a show about Belief and Plot getting along much better than they do in reality. It is once again an escape from the way things are, an itch only Welcome to Night Vale scratches for me these days. But people got furious over the New World Order conspiracies that flooded the episode. They were angry that the show wasn't doing "better" than Alex Jones and Glenn Beck. Jones and Beck are contemptible in real life, but X-Files is not The Wire. It performs a different function. From the first episode when Mulder spray-painted an X on the street and gauged how much time a flash of light made him lose, it's been about indulging in tinfoil hat thinking. Last night's premiere was remarkably faithful. The X-Files didn't change. We did.